On this Sunday 24th March we have our Annual Hike up Keeper Hill. Keeper Hill is near Newport Co Tipperary and is approx. 30 mins from here.This is an event that we like to have as many as possible attend as it is a great challenge to all the boys to complete it.It will take us 5 hrs approx. to complete it.This hike is 17.5 km long and while its difficult in parts it is one that the boys will be able to complete. It is all forest path the whole way to the top. The last section to the top is a little uneven under footWe would hope that as many as possible attend this. Our Scout Group is currently upgrading our Scout Hall to improve fire safety. The following letter is being sent to local businesses asking them for help with the costs of this project. If you know of a company that might be interested in supporting us, we would ask if you could pass this letter on to them. 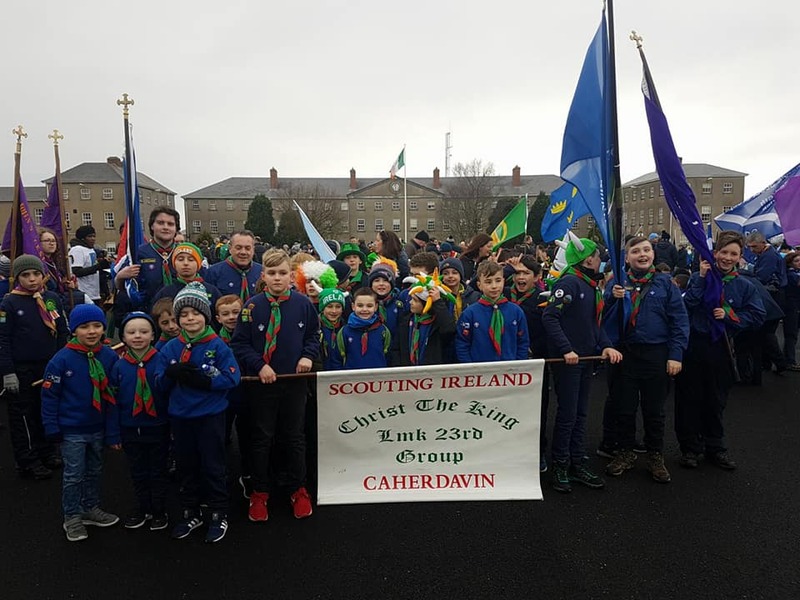 The 23rd Limerick Scout Group is a voluntary youth organisation providing outdoor adventurous activities to young people in Caherdavin and the wider Northside area. Our Group is based out of our Scout Hall on Blackthorn Drive. The hall is also used by several other community groups. The Group is currently in the process of upgrading the Scout Hall in line with Scouting Ireland’s new fire safety guidelines. While the Group appreciates the need for the guidelines, they come with a considerable financial burden to a voluntary organisation such as ours. With this in mind, we are reaching out to local businesses such as yours to support our Sponsor a Fire Door campaign. All we are asking for is a small donation of €100 which will cover the cost of one door. In exchange, the Group will add a plaque to the door with your company’s name on it as well as adding your logo to the supporters’ page on our website. If you would like to sponsor one of the doors, please contact me on the number below. Your support in this campaign will be greatly appreciated. Thanks for taking the time to read this letter. We look forward to hearing from you soon. As you know we have gone through a very hard few weeks in scouting and I would like to thank you all for your great support. We will be group 43 in the parade. We would ask all parents to meet us promptly after the parade at City Hall at Merchant’s Quay so that our Scouters are not left waiting. We will once again be taking part in the St Patrick’s Day Parade in Limerick on March 17th. This year in particular, we are asking for as many members of the Group as possible to join us on the day so we can show the community that we are still going strong. Survivor is the toughest and most challenging activity on the Scout calendar. Teams of 4 will be put through their paces as part of a scenario devised by the Survivor Team. Scouts will need to deal with scenarios, complete tasks and overcome any challenges they are faced with, all this with only limited resources. Following years of extreme weather conditions, civilisation has been reduced to the population living in groups, or Factions. These factions obtain food and equipment through a series of challenges that are decided by the Directorate. Patrols will have to decide which Faction they wish to belong to – WARNING, choose carefully, as the level of the challenges will be based upon the faction you choose. If you excel, you may be moved to the next higher faction – if you don’t, you may be moved to the next lower faction – in some cases, it’s possible that a patrol would wander the wastelands and become factionless. The cost is €40 per Scout. This fee will include camping fees, programme and food for the weekend. We will have sweets for them so any sweets you are giving them please have it in a bag so they can hand it up to us as there will be only certain times for sweets. NB IF YOU CHILD IS ON ANY MEDICATION PLEASE LET THE LEADER KNOW WHEN YOU ARRIVE AND GIVE LEADER THE MEDICATION.